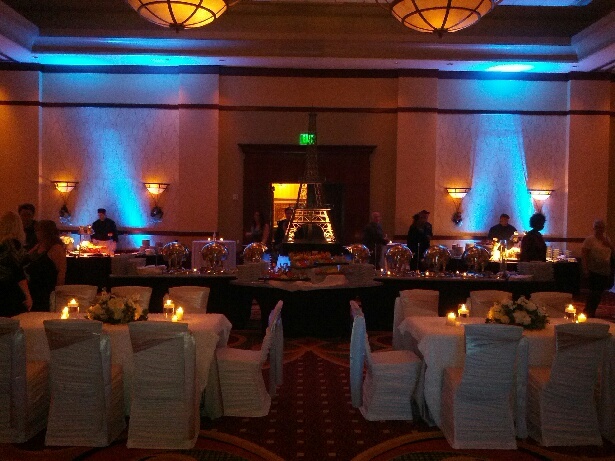 Bring color, elegance, and energy to your event with uplighting! Uplighting is the art of painting with light to transform boring, unsophisticated spaces into a place where your guests feel that they are in a truly luxurious place and part of something very special. A truly well planned event will entertain all of the senses. The first sense that is stimulated as your guests enter is sight! These LED lights can transform rooms that traditionally would look old, plain or boring into a wonderful environment with deep colors and breathtaking accents. When coming up with a budget for your wedding it definitely makes sense to think about adding uplighting as part of your decorating budget. For a fraction of the cost of extra flowers, centerpieces or other types of decorations you can add the elegance and impact of painting with light to your wedding. We can combine multiple lighting techniques to make it absolutely stunning. It looks great in the photos as well, turning ordinary candid's during dancing into the beatiful event that your wedding deserves to be. Uplighting is by far the most cost effective and dramatic event enhancement in a decorator's arsenal. Understanding what is possible with uplighting is helpful. Here are some basic effects that are achievable with uplighting. Color wall lighting- This most popular effect provides washes of individual color (or different colors) around the room. They can be set to a static color or fade through different colors. Placed strategically around the room creates brilliant columns of light up walls, corners or architectural features. Opt to light just the bridal table from underneath and behind to make a gorgeous focal point or uplight the entire room to make it magical and inviting. Under table lighting- This effect can look really great with a bar, cake table or the head table. Placing a light or lights beneath white linen tables adds washes of color to make it glow beautifully. We suggest using under table lighting in conjunction with washes of colors on the walls to create a truly unique lighting effect at the head table and the whole room! Entrance lighting- Nothing makes your guests feel like they are entering a magical evening more than uplighting at the entrance to the venue. It welcomes all to enter and separates the space inside from the foyer area wonderfully. Guest feel as if they are making an entrance into a separate and exciting space. Highlight lighting- Light your wedding cake table, gift table or any other area of your reception for a very low cost. Uplighting in these areas separates them from other parts of the venue, and invites your guests to look and explore. Call today for package details and pricing!